Well my ac voltage protector burn. Slapped in a new one as I have stock. All now I was looking for a new board. The neighbours ac has not worked for the day. Guess who not fixing their ac unit. Did you get scared too? Got a heavy shower in the north an hour ago but quiet after that but looking at that weather to the east it's gonna be a wet thursday. What's the weather like in POS...heading North in a bit. Overcast with a slight drizzle now and then. Downtown PoS has slight cloud cover but generally sunny. Rain like crazy in p.o.s for the last hour so far,everything in a mess as usual,got out of downtown just in time. ^Hey, which website or app did you use to obtain the satellite imagery ? For the last 15 minutes I've been watching a constant lightning show in the southwest of my position in San Juan. Anyone has info? Was watching d same thing. A lot of lightning. Level lightning and thunder right now. So It came on shore this morning around 2am an hasn't left yet. 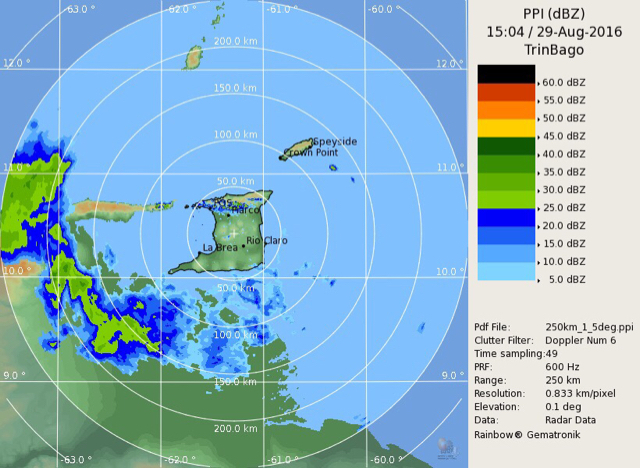 Looking south of San Fernando looks stink with rain. Level lightening since last night. All that heavy rain and now blue skies.